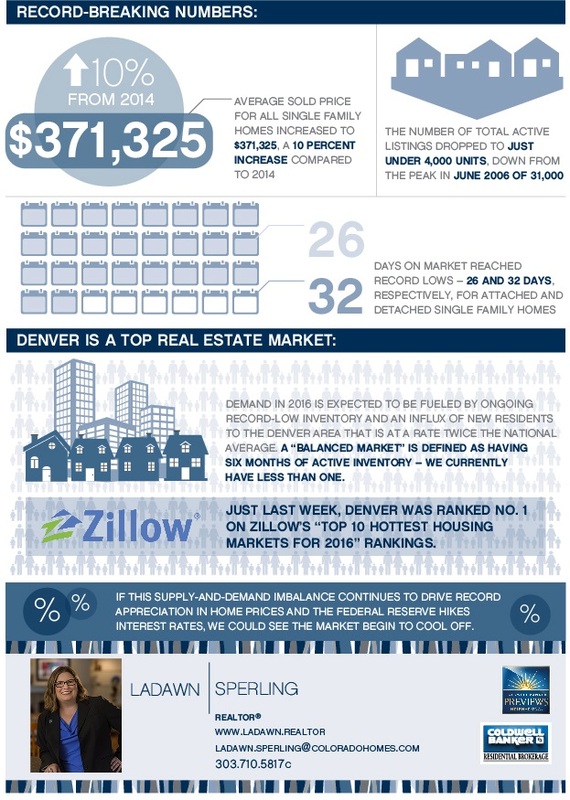 All this resulted in the Denver area being one of the top real estate markets in the country last year. This trend could continue in 2016 as demand is fueled by ongoing record-low inventory and an influx of new residents to the Denver area that is at a rate twice the national average. In fact, a “balanced market” is defined as having six months of active inventory – we currently have approximately one.Just last week, Denver was ranked No. 1 on Zillow’s “Top 10 Hottest Housing Markets for 2016” rankings. However, if this record appreciation in home prices continues and the Federal Reserve hikes interest rates, we could see the market begin to cool off. Even though our market is still hot, buyers remain sensitive to pricing and home conditions, and there continues to be many competing offer situations. Navigating our active real estate market can be challenging for both buyers and sellers. If you need any advice or assistance with your real estate needs, contact me today. Based on information from REColorado®, Inc. for the period of December 1, 2015, through December 31, 2015, for Adams, Arapahoe, Broomfield, Denver, Douglas, Elbert and Jefferson Counties. Note: This representation is based in whole or in part on content supplied by REColorado®, Inc. REColorado®, Inc. does not guarantee nor is in any way responsible for its accuracy. Content maintained by REColorado®, Inc. may not reflect all real estate activity in the market.